One of the biggest requests we get is “how can I see what my receiver is receiving/sending”. Well, we have a solution to that! When you visit one of the “custom feeds” pages, you’ll see the standard VRS screen that you’re used to on the main ADSBexchange site, with one difference. If you click on “Menu -> Receiver” you’ll see a list of specific receivers you can view. Some receivers which belong to specific ADSBexchange contributors have names, while others that are currently unclaimed start with “zCons…”. Configuring these feeds is a manual process – therefor even if a feed look unclaimed there may be data on it and it hasn’t been updated by ADSBx. Please select the desired feed and wait a few minutes to see if there is traffic on it. In order to get your station and it’s traffic appearing on this screen, you’ll direct your feed to feed.adsbexchange.com on a particular TCP port number. That number is at the end of the name, typically starting with 51xxx or 53xxx. 51xxx ports expect data in Beast/RAW format. 53xxx are for users feeding from their own VRS instances in VRS Compressed format. Go to one Custom Feeds Live Maps using the links in the main website menu. Other Tracking Info -> Custom Feeds. Pick a zCons-51xxx or zCons-53xxx. Looking at the list, let’s say zCons-51123 is open and when you select it – no traffic appears in a minute or so. If zCons-51123 has no traffic. Instead of feeding to the standard port on “feed.adsbexchange.com” on port 30005, simply use port 51123. DO NOT CHANGE MLAT CLIENT PORTS ON THE PI FEEDERS. Once you have that up and running and you can see your traffic, fill out the form here to customize the name of the feed, and register your location if you want range rings and the “range splat” to be calculated. Please include an appropriate port, latitude, longitude, and feeder name. A range “splat” (see example) shows how far your receiver can see aircraft at various altitude. Different altitudes are represented by different colors. Like the main radar screen, the default refresh time is 5 seconds, however you can adjust it as low as 1 second under Menu -> Options. On our back-end database, all traffic, planes and positions received from your feed are tagged in the database with your receiver ID. In the future, we can give you statistics, such as “have I seen a certain plane”, and any number of other things we’ve yet to dream up. Bottom line – we have the data and can slice/dice it, and provide it back to you. View your receivers’ traffic when you’re out and about via our mobile/tablet site, or other apps (coming soon). See only your traffic. If you have, or are testing multiple receivers, you can setup custom feeds for each to compare ranges, etc. 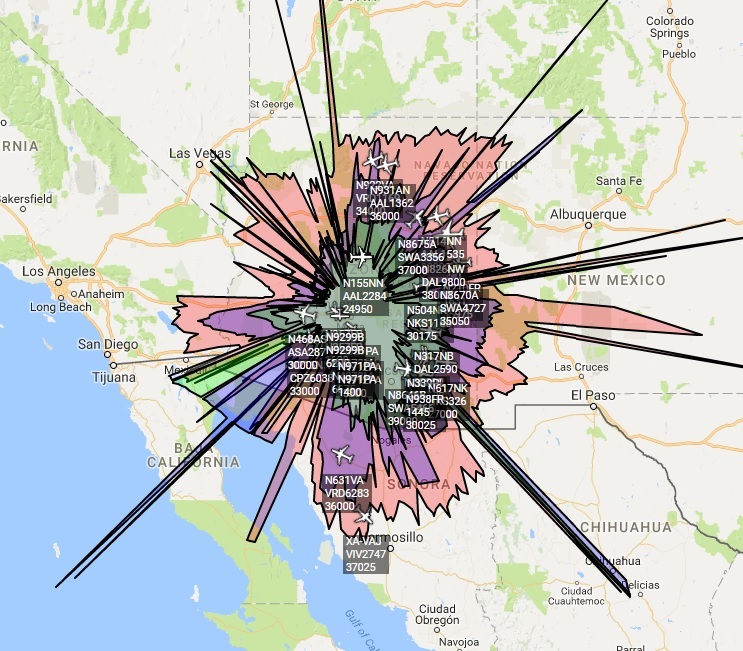 Compare 1090mhz coverage to 978mhz (in the US). Test different antenna and SDR configurations to see how your range is affected. If you find this useful, donations are always appreciated, but never required! So, check it out and get started today!